A sharp crack pierces the brisk autumn air. The harsh cries of many men resound through the forest, the barking of dogs, another sharp crack in the distance then loud cheers. The serenity of the countryside in Italy changes this time of the year when dedicated hunters follow a centuries old tradition spending a healthy day in the country to hunt the wild boar. Seeing and savoring Italy during this time of the year is invigorating. The deep colors of the autumn landscape open the estates and reserved hunting areas in Tuscany and Umbria for organized wild boar hunting. An ancient sport, the boar hunt in Italy goes back to Roman times where the fierceness and strength of the boar made it a worthy opponent. Images of wild boars, alone or as part of a hunting scene have been discovered decorating a wide range of historical objects. There is a marble statue of a wild boar made by Florentine sculptor Pietro Tacca (1577-1640) that sits in the Uffizi in Florence as testimony to its hallowed position. The Italian love of wild game and their preference for rustic cooking makes cinghiale (wild boar) a popular dish throughout the region. In fact, cinghiale is so popular in Tuscany that it is considered by some to be (unofficially) the national dish. Eating cinghiale follows a food tradition of a time when hunters (cacciatore) went into the chestnut forests and mountains to hunt the wild boar and bring it home to feed their families. Wild boars still roam the forests and vineyards and in autumn local hunting clubs continue the hunt. I have driven through Tuscany and Umbria during this time of the year and heard the sounds of hunters shooting in the distance. It was unusual at first to be so close to the origin of the food we find on our tables. In the US we are removed from the process of providing food and the thought of hunting as a source of protein seems archaic and unnecessary. Yet hunting in Italy, as in most of Europe, follows an ancient tradition and the seasonal sport of hunting is not considered to be politically incorrect or inhumane. Italians take great pride in the preparation of wild boar and consider it to be a specialty. There are many recipes that use the meat of the wild boar with stewing (scottiglia di cinghiale) or braising being preferred as the meat can be tough if not properly cooked. It is often prepared alla cacciatore (hunter style) and served with pappardelle. The rich thick noodles are a perfect background for the strong, robust flavor of wild game so you often find this type of pasta served con lepre (with wild hare ) as well. 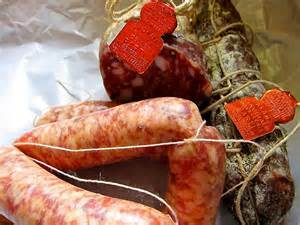 Italians also like sausages, prosciutto and salami made from wild boar meat. I have eaten wild boar in Italy many times and like it very much. It has a strong flavor but not unpleasant rather rustic and bold. 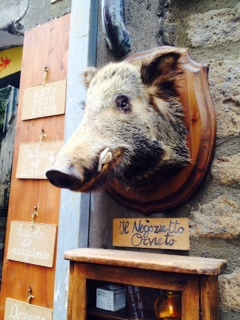 Shops in Italy that sell wild boar meat often display a stuffed wild boar’s head outside their store front that can be quite startling to see at first. If you are unsure about eating wild boar and would just like a taste look for a sagra in Tuscany or Umbria. These seasonal food festivals celebrate regional culture and cuisine with music, dancing, games, exhibits and of course food. In the small medieval Tuscan town of Suvereto, 90 km from Florence, the Sagra del Cinghiale (Festival of the Wild Boar) is held every December with exhibitions and medieval pageantry with food stands and local restaurants serving wild boar. There’s also a Sagra del Cinghiale in Certaldo. Capalbio and Chianti . . . well you get the idea. Wild boar is very popular. The traditions surrounding the eating of a particular food is a reason to celebrate in Italy so if you happen upon a sign along the road that says “Sagra del Cinghiale” or “Sagra del whatever” you should stop and go. In my book I write about a style of travel that pairs the pleasures of eating with the history and art of a region that result in a unique travel experience way beyond a “show and tell tour”. Part of that can certainly be found in the food served in almost every ristorante, trattoria, osteria and enoteca in Italy. Over the years many people have asked me what is the best place to eat in Italy. For me the best place to eat in Italy is at the home of your family. The second best place is at the home of your friends and the third best place is at “un ristorante” chosen by your family or friends. Having said that I’ve added a corollary that is a natural consequence of my experiences eating, shopping and cooking in Italy with my Italian family and friends, one that you may want to try on your next trip – cooking nella tua casa (in your house) as in your vacation house. For our last few trips to Italy we decided to rent either an apartamento or house as an alternative to other more conventional accommodations and cooking in. We enjoy shopping the local markets and alimentari (grocery stores) and using regional ingredients to make at least one of our meals “at home”. Of course if you do this, depending on where you are staying, you should have a conversational understanding of Italian as you will be shopping and buying your ingredients at local town markets where English is not the main language spoken. A vocabulary of food and words and phrases associated with weights, measures, numbers and money are always good to know as in “Un chilo di mele, per favore.” – a kilo (2.2 pounds) of apples, please. “Tre pere, per favore” – three pears, please. Here are a few helpful links to grocery shopping in Italy. Be sure to bring your favorite recipes from home to cook in (in Italy). We’re traveling to the Rome, the Kingdom of Tiramisu. Known as such because of Bar Gelateria POMPI (Via Albalonga 7B/9/11-00183 Rome) – said to make the most delicious authentic tiramisu you will find during your travels in Italy. This iconic Italian confection made from layers of espresso soaked savoiardi biscuits (ladyfingers) slathered with custardy mascarpone cheese, sprinkled with cocoa is said to have originated in Venice based upon a classic zabaglione custard. Perfected in Treviso, where you can still enjoy the classic tiramisu recipe at Ristorante Le Beccherie, it took Giuliano Pompi and Rome to make it eternal. The name, tiramisu comes from the local dialect of “tirarse su“, the action of pulling yourself together, of recovering your energy. 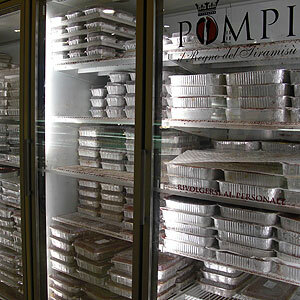 Listen to Bar Gelateria Pompi explain the origin of the name, why their tiramisu is so good and the three most important ingredients in the making of this memorable Italian dolce. The piazze and arcaded porticoes of Italy are the settings for some of the most pleasurable shopping experiences you’ll find in your travels. Collectables and found objects are tucked into the nooks and cranies of almost every town, village and city where locals and tourists alike shop for unexpected treasures and destination bargains at open air markets and tented booths. The markets often have colorful names like the Mercantino del Pidocchietto (Little Louse Market) in Passignano sul Trasimeno or La Soffitta Sotto i Portici (the Attic under the Arches) located under the ancient arcades of Piazza Augusto Imperatore in Rome. The Mercato delle Briciole (Market of the Crumbs) in Spoleto may allude to the cast offs or crumbs that fall from the master’s table, however the antiques, crafts and collectables found at this market are anything but. Located in the centro storia (historic center) of the city, over 100 exhibitors fill their stalls with antiquarian delights and products typical of the region. These cose d’altri tempi, things from another time, are often long cherished heirlooms ready to be re-purposed by another kindred spirit. We can only imagine, or if we are lucky hear, the stories of the interior life found in each object. 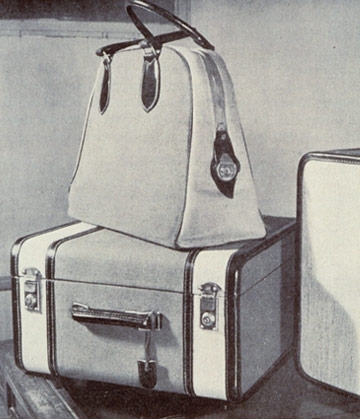 The connection to an owner, place or event that lives on in their possessions. 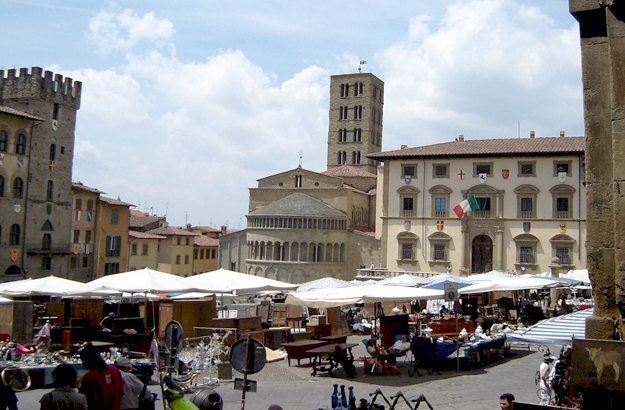 Two of the most famous antique fairs in Italy are in the town of Arezzo with more than 1,000 vendors from Italy and all over Europe and the Mercatore del Naviglio Grande, held along the canals in Milan’s artsy Navigli district. There are many antique and flea markets to see and savor in Italy including several called Il Tarlo (The Moth). Held in Genoa and various other towns, in this case, the moth is a good omen of the fabulous finds to be found. Dates and specific information on locations for these and many other antiquarian markets in Italy are listed on-line at sites that specialize in flea market shopping in Italy. Rome, Florence and Venice are the “holy trinity” of Italian travel – an iconic itinerary that almost every tour operator suggests as part of the Grand Tour of Europe. Rome, the historical godhead, Florence the inspirational daughter and Venice the spiritual muse. There are few cities in the world that create such a mystical union of travel experiences. But seeing and savoring the hyperbolic landscape of Rome requires a different philosphy of travel, one with a less is more point of view. We’re beginning with accommodations outside the tourist flow at an home on Via Gregorio VII near Vatican City. We’ve been to Rome before and following our paradigm that the quality of travel is far more important than quantity we decided to look into an different type of stay this time around, a private residence listed by a community of global “hosts” who rent out an entire home, flat, apartment or even an extra bedroom to travelers looking to get off the tourist radar. We stayed at properties like this before and we find it an interesting alternative to the standard type of travel accommodations. It allows us to live like a local, can oftentimes be more economical and less constrained than a standard hotel room. Internet sites like Airbnb, Vrbo, HomeAway and FlipKey by Trip Advisor connect host individuals to travelers who desire to rent short-term lodging in “homes and apartments, private rooms, castles, boats, manors, tree houses, tipis, igloos, private islands and other properties” to create a more personalized travel experience where the how and why of travel is just as important as the sites you see. And if you’re wondering as to whether there’s a lot to pick from, in only five years Airbnb has created a “shared marketplace” that offers 300,000 listings in 35,000 cities in 192 countries. Past properties we stayed at included an apartamento in Milano a few blocks from Piazza Duomo and a residence apartment in Portogruaro near Venice. Our host in Rome offered a flat with 3 bedrooms and 3 baths, linens, internet access, furnished kitchen and terrace. When renting a property through an agency like Airbnb remember to inquire about whether heat is included which can be expensive in European countries and information about deposits and cleaning fees and whether bathrooms will be shared and if you will have full or limited access to a kitchen. Also map the destination on an expanded view and street level to make sure of the location, surroundings, walking distances to sites you want to see and proximity to public transportation. Read property reviews on multiple sites for what others are saying about their experience. Don’t just rely on pictures. Depending on your travel goals and the number in your group (in our case 8) you may find that seeing and savoring Italy from the comfort of your own private space is the ideal way to travel and the home-away-from-home atmosphere these types of accommodations provide just what you need. Our Airbnb “host” confirmed our stay in Rome with the promise that “Rome is waiting for you”. We’ll return at the end of October to let you know how we were welcomed!